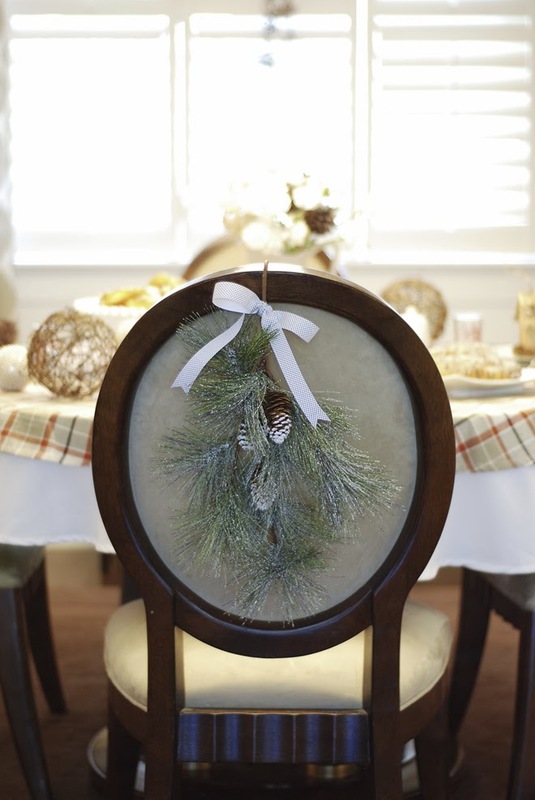 A few weeks back, Canadian Tire approached me and a few other bloggers with a design challenge: use some of their decor products to style a holiday table for feature in their latest digital magazine. 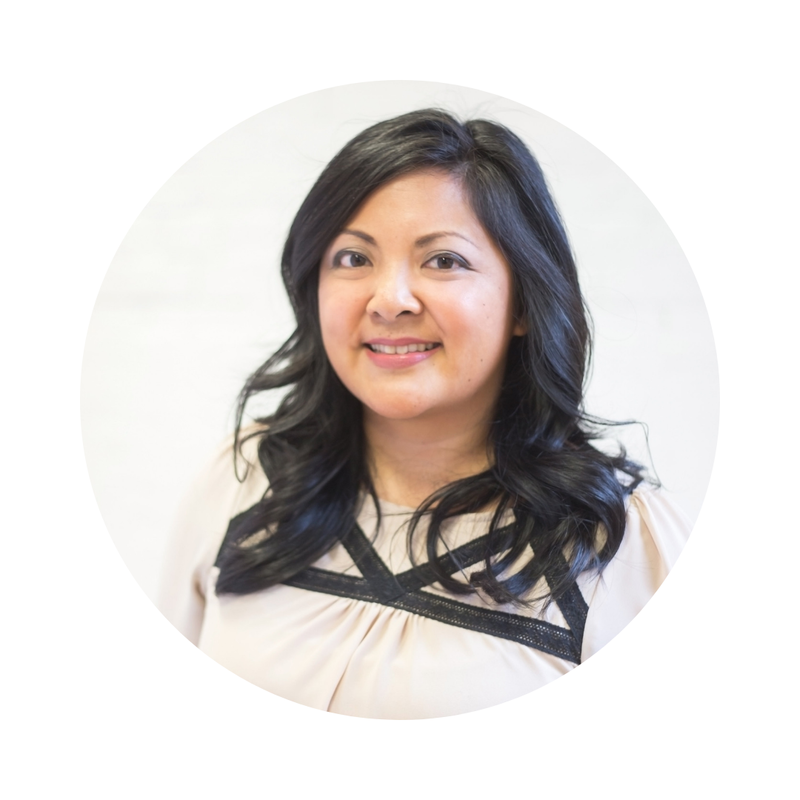 I've always had a soft spot for Canadian Tire - it's where I bought my first pair of skates and as a kid, I would carry Canadian Tire dollars around stuffed in my pockets for all sorts of make-believe games - so I was happy to take on the challenge. The store is a part of the Canadian fabric and the place to find just about any household item you need and can't find anywhere else. A box full of ornaments, dishes, and accessories soon arrived on my doorstep. There were rustic critter ornaments, a blue-grey dinnerware set, serving accessories, and table linens that were just my taste - this was going to be fun! If you've been reading here a while, you might know that we host an annual Pancakes & Pajamas party for just my immediate family the week before Christmas. We enjoy breakfast for dinner, sort of an evening brunch. I look forward to this meal all year long so I thought I would style the table for that special occasion. I wanted the table to feel casual and rustic yet elegant. 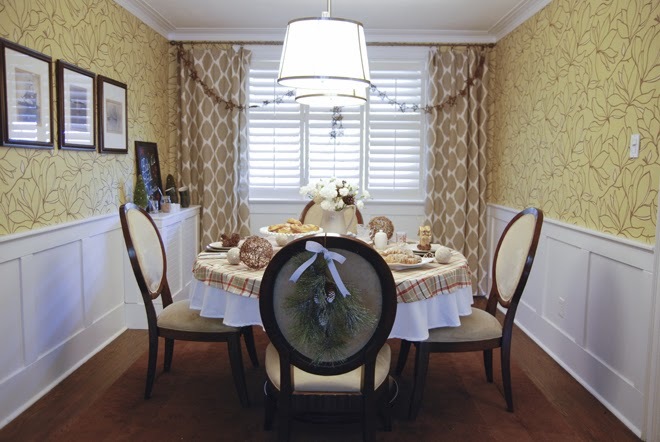 A brunch is all about easy entertaining so the decor should be unfussy and relaxed too. 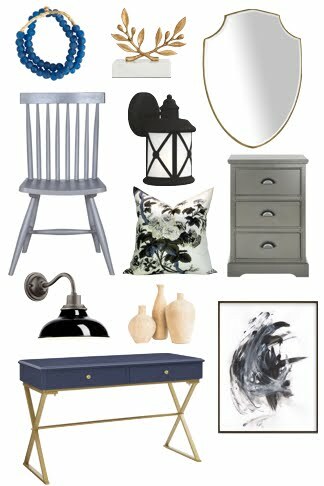 I rummaged through my cupboards and started decorating with a few of my own favourite basic pieces... the plaid tablecloth, the painted wood slices from the cottage (I use these for decorating all the time), the woodgrain pitcher (it's 50% off right now!) and a thrift store creamer. 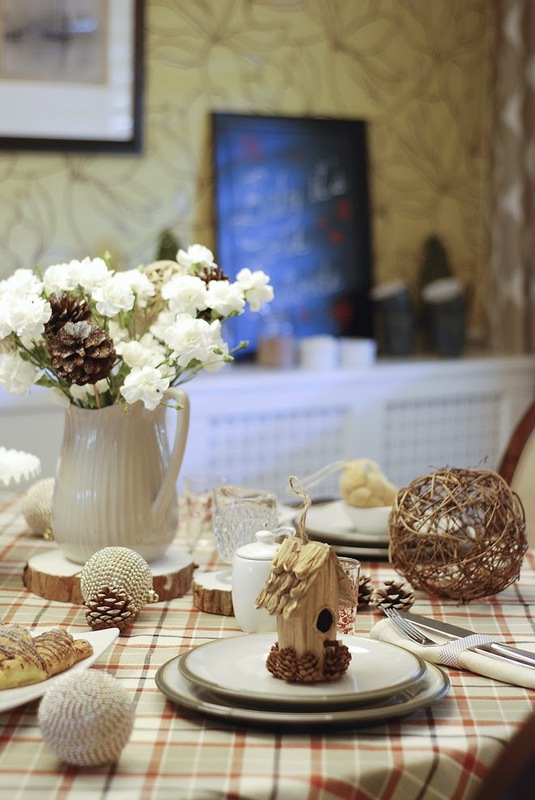 A vintage hobnail cake stand, one of my antique finds, adds height without obstructing the table, and the pine cones and vine balls from Canadian Tire provide texture and enhance the cozy feel of the table setting. But you can't celebrate the holidays without a bit of shimmer so I added the beaded ornaments for contrast. I think its always nice, especially during the holidays, to include a few heirloom pieces in your decor. They give a sense of tradition and history and make for great conversation pieces too! Like the small juice glasses with the floral design - these were a wedding gift to my parents that I've inherited and the red works beautifully with the tablecloth. 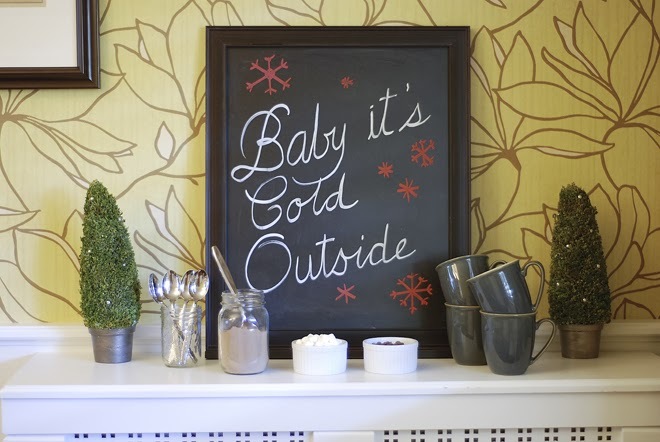 Decorating shouldn't be difficult; you can elevate your decor with a few simple but thoughtful touches. 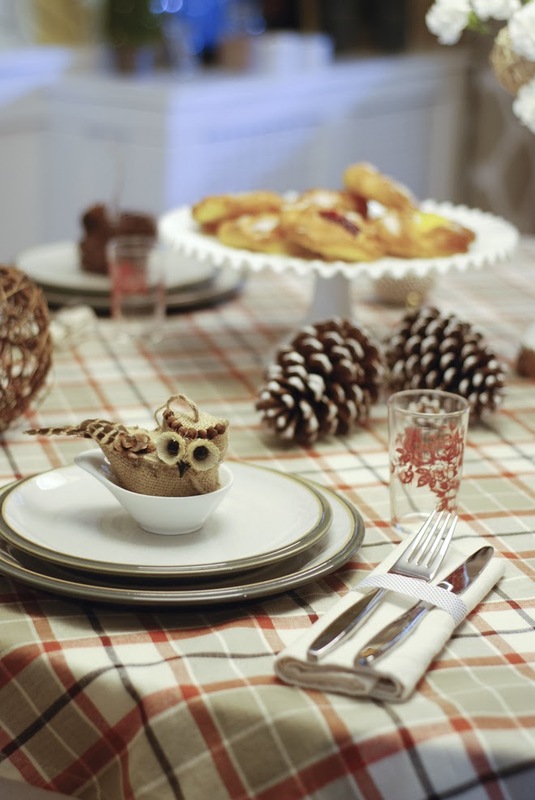 An ornament at each place setting becomes a take-home gift. Everyday silverware feels less ordinary when wrapped with a ribbon and placed atop a linen napkin. 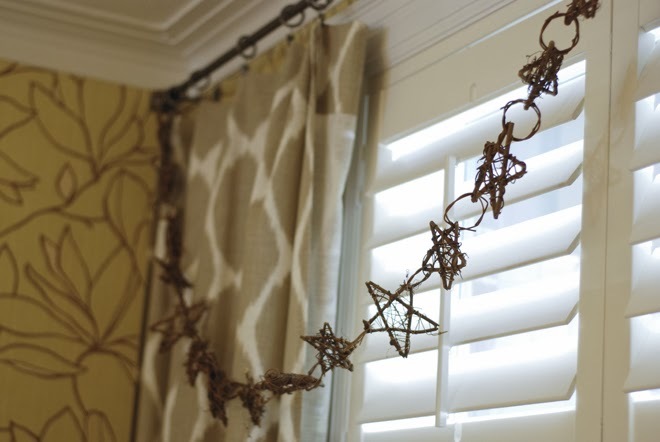 I really love the starry twig garland. Had I seen it in the store, I might have thought it looked too "country" for my home and and not picked it up, but it works well with the organic feel of the drapes. The twig is a great alternative to a more traditional garland made of greenery or beads and brings in the earthy tones I've been craving more of this year. Here's a look at the whole room. 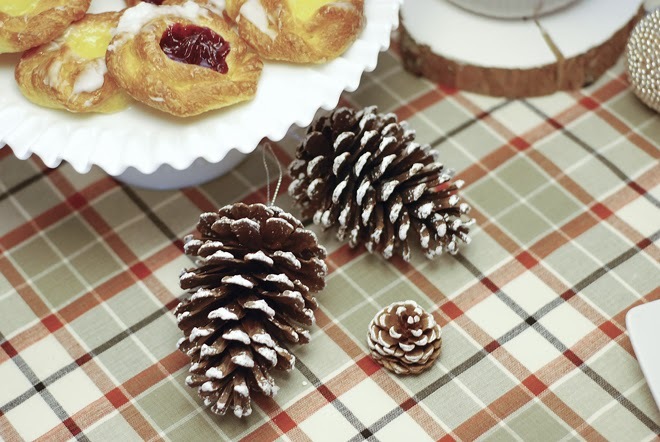 I am crazy over that snow covered pinecone spray. I never know how to use those things... I decided to bend the wire on this one, hook it over the back of my round-back chair, and add the same polka dot ribbon that was on the silverware for a finishing touch. I call dibs on that chair! 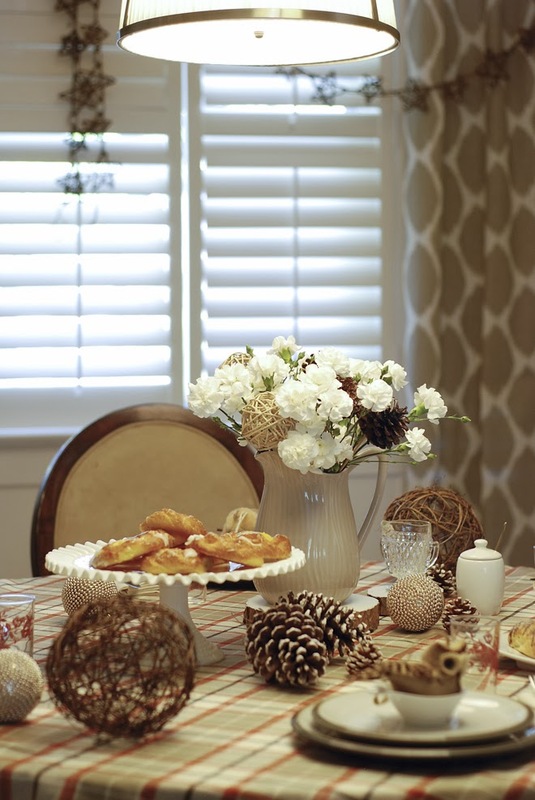 This table setting encompasses the best of the season for me: easy entertaining, a bit of elegance and tradition, and ample room for good food, friends, and making new memories. 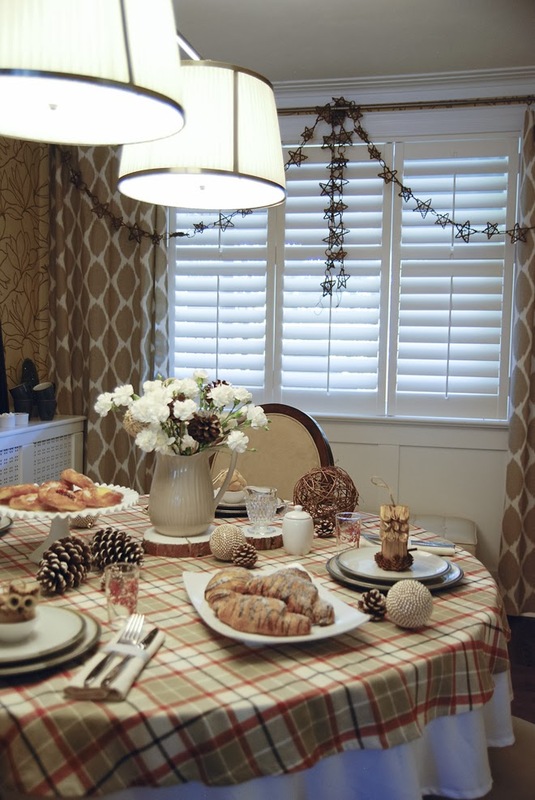 If you'd like to see more inspiration for holiday decorating, visit Shannon, Kerri, and Jo-Anna to see how they've styled their Canadian Tire goodies or read the latest Canadian Tire digital magazine to see more.